Dates: Saturday, May 11 & 18, 2019 - This workshop will be a two part class on two consecutive Saturdays. Students will be able to work on their projects in their own studios between workshops. ​This class if for intermediate students. It is important to measure, cut and file accurately for hinges and clasp to work property. Linda will be teaching her updated etching process, which she is very excited to share. In the example above, she used large granules to embellish the cuff. Students will learn how to make granules as embellishment. Feel free to bring other parts to use for your own embellishment. Class will cover, etching, piercing, fabrication and finishing. After the first day, students will take their piece and work on refining it inter own studios. You may be able to make two cuffs in the week prior to the second class. On the second Saturday, students will work on finishing their pieces. 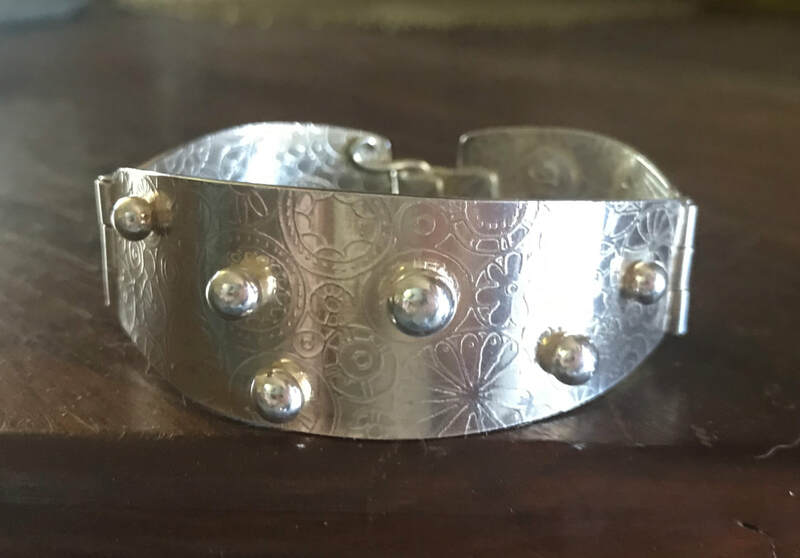 Sterling Silver 18 gauge sheet one inch wide plus the length for your wrist. Using a cloth measuring tape measure your wrist circumference at the widest part, which is usually at the wrist bone. To that measurement add 1". Fine silver wire or scraps for making large granules or whatever embellishment you want to use. - half round and flat file in cuts "0" and "2"
​There are only 3 parking spaces in front of the school on weekdays. Park on the street, not in the complex. Parking is available during the weekend inside the complex. A cuban restaurant is in walking distance on weekdays.